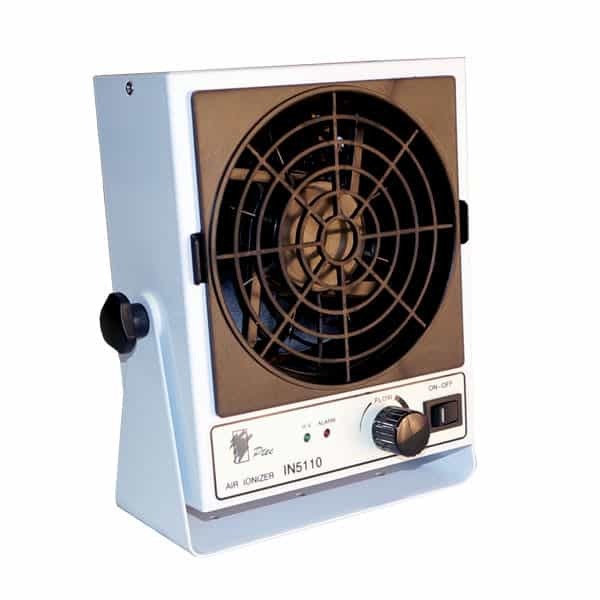 The Ptec™ IN5110 68KHz AC benchtop air ionizer is a small, efficient static elimination device with variable fan speed for protecting electronic components and general static protection. Using AC corona technology, to make the air more conductive, Ptec™ ionizers produce a balanced stream of positive and negative air ions that never need calibration. These devices are used in many industries and manufacturing applications where static electricity is a problem. A specialized piezoelectric high voltage transformer makes Ptec™ ionizers among the most reliable ionizers manufactured. Small, lightweight and stable, Ptec™ products are designed to remain in balance and to alarm when the HV output affects performance. 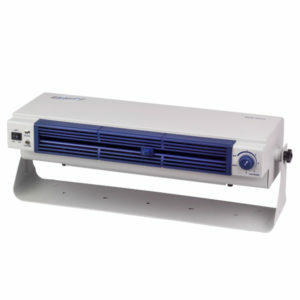 The model IN5110 benchtop static eliminator produces a 68KHz AC output of approximately 2200V and a continuous stream of balanced air ions. Ionizers that use Ptec™ technology do not require calibration and only minimal maintenance. On the front panel of the IN5110 are two LEDs. The green LED indicates that power is applied to the unit. The red LED is illuminated when an alarm condition occurs. 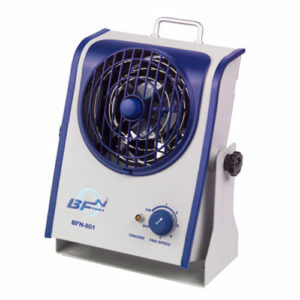 A variable fan speed control, on-off switch, and removable finger guard are also on the front panel.The rear panel of the ionizer has the 24 VDC power input connector and a grounding point. Excellent ion balance and ionization performance. 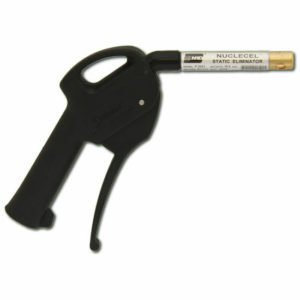 Durable, replaceable tungsten alloy emitter points. Removable front grill. Adjustable air volume. The IN5110 can work on all power circuits, from 100-240volts, without any adjustments. This means the standard ionizer can be used in many different countries and power circuits and performance will not be affected. 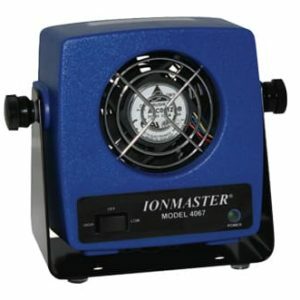 The IN5110 ionizer comes factory calibrated and with a calibration certificate. Ionizer performance can be tested and verified with a charge plate monitor. Important tests to perform are positive and negative decay times and ion balance. It is recommended to test ionizer performance at least 1 per year. Less Than 2secs at 12in.